Got a 3D printer? Never buy shoes again! Finish artist and designer Janne Kyttanen is has created some terrific shoe designs, the 3D files of which he is giving away free on his website, to anyone who want to print themselves a pair. Kyttanen graduated from The Gerrit Rietveld Academy in Amsterdam 2000, where he also currently lives. During his studies he envisioned a future where products would turn into computer data and their distribution would be as easy as downloading music from the internet and production could happen in people's homes. 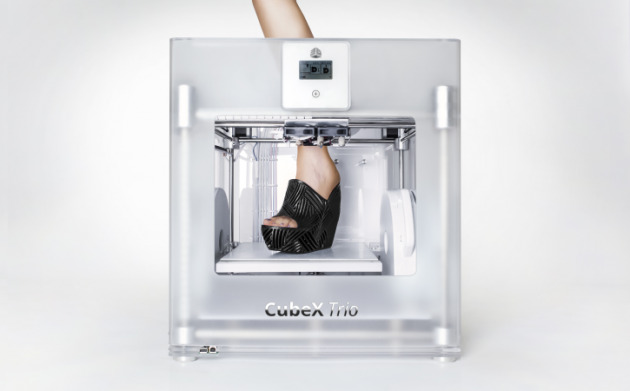 His shoes are designed for strength and can be printed overnight on the CubeX 3D printer. And you can make them in any color you like.